A review of TUNEL staining kits and an overview of the processes involved in TUNEL staining. ‘TUNEL’ stands for Terminal deoxynucleotidyl transferase dUTP nick end labeling. Otherwise known as the TUNEL assay, TUNEL staining is used to detect DNA breaks formed during the final phase of apoptosis, when DNA fragmentation takes place. Terminal deoxynucleotide transferase (TdT) is an enzyme that is expressed in certain immune cells. As it attaches deoxynucleotides to the 3’-hydroxyl terminus of DNA breaks, TdT is pivotal to the TUNEL staining method. TdT acts during the process which generates antibody diversity – V(D)J recombination – and the nucleotides attached by it are tagged in TUNEL staining. This tagging is either done directly, using a fluorescent label, or indirectly, using a chemical label that can be linked to a fluorescent label or enzyme. The TUNEL staining method offers a contemporary alternative to the traditional method of using agarose gel electrophoresis to analyze the formation of DNA fragments during apoptosis, as seen in Apoptotic DNA Ladder Isolation Kit ab65627. Light microscopy is the most frequently used method for analyzing TUNEL staining. Fluorescent TUNEL methods can also be used for analysis by flow cytometry. A bromo-, digoxygenin-, or FITC-tagged nucleotide. This is subsequently bound by an antibody which is specific to that tag. This antibody is labeled, either using a fluorescent dye or an enzyme such as HRP for chromogenic detection - For example, BrdU-Red TUNEL assay kit ab66110. Gao Y et al. used HRP/DAB TUNEL assay kit ab206386 to analyze tissue sections from mouse ovaries. a. Section treated with DNase I as positive control. b. Negative control without TdT enzyme. c and f. representative experimental images. 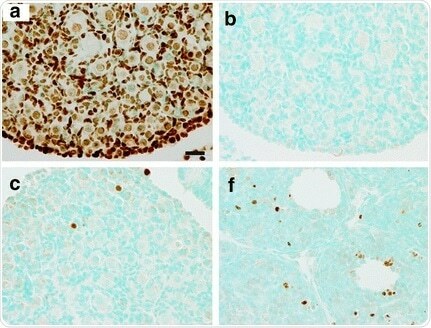 Nuclei stained with the TUNEL assay are brown. Sections were counter-stained with Methyl Green. Indirect methods which make use of an antibody or a streptavidin-biotin complex are not as fast as TUNEL staining protocols which use a nucleotide directly tagged with a fluorescent dye. This is because TUNEL staining protocols require fewer staining steps. However, methods relying on biotin-tagged nucleotides may benefit as the streptavidin-biotin complex is amplified. Although additional blocking steps are required, both to reduce background staining and neutralize endogenous biotin, these steps are well known to all researchers running traditional chromogenic immunohistochemistry. A brighter signal may also be produced by BrdU-based methods, as BrdU is usually incorporated more easily by the TdT enzyme. Every paper surveyed utilized the TUNEL assay in imaging as opposed to flow cytometry. DAB substrate was added where HRP was utilized in order to create a brown stain. A kit was used for TUNEL staining in over 90% of these research papers. Hopkins J et al used BrdU-Red TUNEL Assay Kit ab66110 to examine apoptosis in testis from 8-week old Stag3+/− and Stag3−/− mice. Apoptotic cells are red. DAPI was used as a counterstain. To conclude, a practical technique for analyzing DNA fragmentation in apoptosis is provided by TUNEL staining.